We do NOT offer full refunds, but we do offer partial refunds, per our policy below. The right way to get a refund is to email us at and ask us for a refund. Filing a claim on your own with PayPal or filing a charge back with your credit company will just cost you and our company much more time and money in resolving the refund dispute. It is a very inefficient way of resolving a dispute which is why we highly recommend just sending us an email as our customer support is very responsive and will take care of your issue right away. Below is the more thorough and detailed breakdown of the deductions from your original amount paid to the refunded amount. before we review the information you have submitted, you will get a refund of to the amount you paid less a $10 processing fee. The $10 processing fee covers out time in communicating with you, locating and deleting your application from our database, issuing the refund, and dealing with the additional accounting work resulting from the sale and subsequent refund. after we have reviewed your application once but before submitting it to the US Government, you will get a refund of to the amount you paid less a $10 processing and less a $15 first review fee, for a total of $25 in deductions. after we have reviewed your application twice but before submitting it to the US Government, you will get a refund of to the amount you paid less a $10 processing, less a $15 first review fee less a $15 second review fee, for a total of $40 in deductions. after we have reviewed your application three times, there will be NO REFUND. There will be no refunds if your application has already been filed to the US Government. An infographic is provided below to better understand the policy. after we have reviewed your application once but before submitting it to the US Government, you will get a refund of to the amount you paid less a $10 processing fee and less a $20 first review fee, for a total of $30 in deductions. 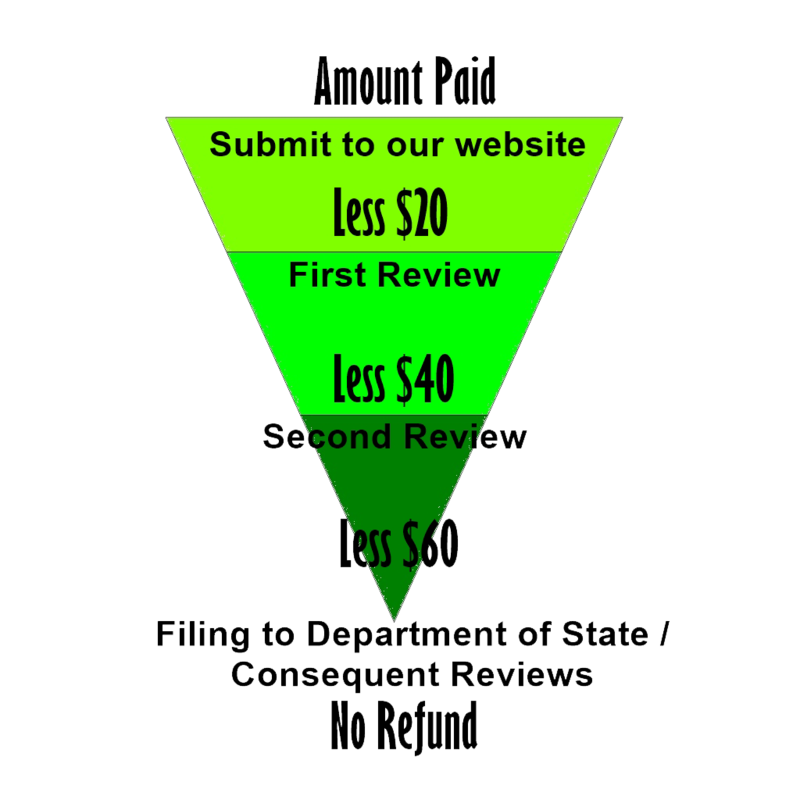 after we have reviewed your application twice but before submitting it to the US Government, you will get a refund of to the amount you paid less a $10 processing, less a $20 first review fee less a $20 second review fee, for a total of $50 in deductions. before we review the information you have submitted, you will get a refund of to the amount you paid less a $10 processing fee and less a $10 PayPal/Credit Card claim fee, for a total of $20 in deductions. after we have reviewed your application once but before submitting it to the US Government, you will get a refund of to the amount you paid less a $10 processing, less a $10 PayPal/Credit Card claim fee and less a $15 first review fee, for a total of $35 in deductions. after we have reviewed your application twice but before submitting it to the US Government, you will get a refund of to the amount you paid less a $10 processing, less a $10 PayPal/Credit Card claim fee, less a $15 first review fee less a $15 second review fee, for a total of $50 in deductions. after we have reviewed your application once but before submitting it to the US Government, you will get a refund of to the amount you paid less a $10 processing, less a $10 PayPal/Credit Card claim fee and less a $20 first review fee, for a total of $40 in deductions. after we have reviewed your application twice but before submitting it to the US Government, you will get a refund of to the amount you paid less a $10 processing, less a $10 PayPal/Credit Card claim fee, less a $20 first review fee and less a $20 second review fee, for a total of $60 in deductions.